Which sounds very confusing since there are examples from both categories that are interchangeable. Culinary use of the term “herb” is more restricted. Culinary use of the term “herb” is more restricted. Culinary use typically distinguishes between herbs, from the leafy green parts of a plant, and spices, from other parts of the plant, including seeds, berries, bark, root, fruit, and even occasionally leaves. Let s start with the spices. Although almost every country has it ‘s own unique spice, the birthplace of spice is India. Almost all the spices are coming straight from India, shipped in large containers traveling for a couple of months in the Pacific, Indian and Atlantic ocean. Spices is broad category that can be actually divided in five major categories. Seeds, Berries, Pods, fruits and plant parts. So in the seed we have samples like: mustard seed (yellow & brown) sesame, coriander, poppy seeds. 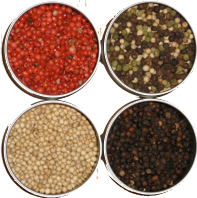 In the berry section we meet Black green, back and white pepper, juniper, allspice, pink peppercorn. At the fruit section we have spices such fennel, cumin, caraway. In the pod we have cardamom and the oh so famous vanilla. And then we have the strange plant parts, like cinnamon and cassia that are park segments and ginger and turmeric. With exception of the root and bark, all the other I buy in whole version. 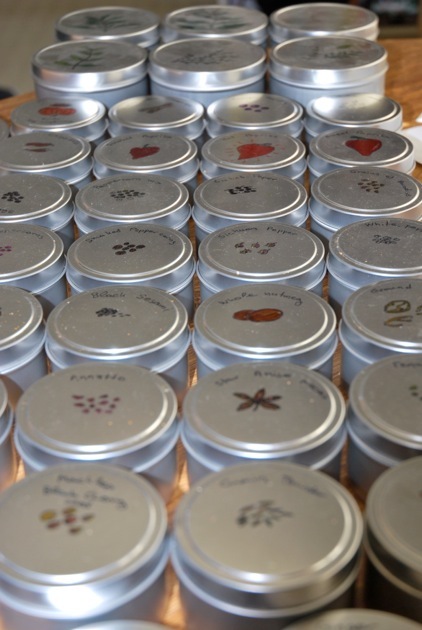 Spices as soon as they are gridded start to deteriorate and lose flavor, aroma and heat. So with exception of ginger turmeric all the rest are in whole form. For the herbs are not really that much to say. They are as we already mentioned the leafs of certain plants. Although they exist in dry fresh form, those that you can really keep for long are the dry. I prefer the fresh version, since it comes with a nice hip taste of freshness. The dried are usually only the leafy part. When it comes to storage it is simple. There are three elements that are actually spice/herb enemies; heat, moisture and light. So we need a container that keeps as much of it as possible away. You need to stay away from plastic since the oils of the spices can bind to it. I used to use those containers that is shown on the left. The container has to dispensers on the side for shaking and pouring spices. It was pretty, and since they are magnetic they can stick on the refrigerator or other magnetic surface and give a really nice effect, just like the picture. But I concluded that I have issues with them. 1.The lid, although allows view to the inside, allows light to sneak in and deteriorate them. 2.The dispersing holes allow air to come in and again assist the deterioration. 3.The same holes have to be closed in a very particular way, if not the spices, especially those that are powder, are running out. And since I measure the amount I am adding, I never really use the dispensers, I always spoon it. So recently I moved to those shown in the picture above. 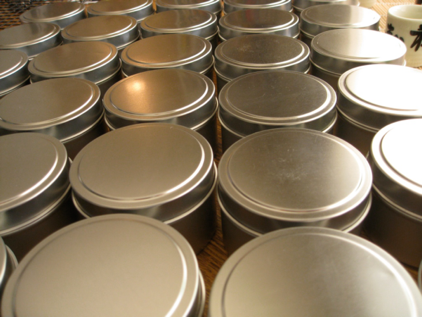 They are food grade tins that are available for very cheap at various resellers on line in various sizes and shapes. I got mine from here and they came with a little over a dollar each including shipping and handling. They have a tight lid, nice matte finish and as you can see are very pretty. You can use adhesive velcro tape or magnets to stick them to surfaces. Alton Brown fro food network uses the velcro tape to stick the to the inside of every cabinet. My cabinets have shelf that extend all the way to the edge of the cabinet and therefore it is hard to do that. I use magnets to stick them on the refrigerator. You can also decorate them the way you want, write the spice name, or a nice drawing, like I do. Glass containers are also very good as long as you keep them in dark places, like a cabinet. 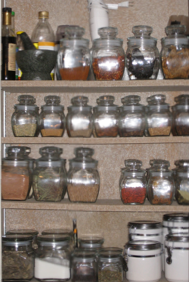 I use a lot of glass containers mainly for storing large dried peppers, aggressive spices such glove, large spices like cinnamon sticks, star anise, And large quantities of tea, coffee and sugar. It is convenient for spice mixtures that used in large spoonfuls, like curry and even extend to grains or legumes. Tight fitting lid is key here, but as it is true for all containers it is hard to find and harder to maintain. Very expensive apothecary style jars offer that, but we are cooking not doing chemistry… well we are doing chemistry, but we are not a high tech chemistry lab. Besides, the one thing you have to keep in mind is that no matter how well you stored your spices they cannot last more than 6 months in powder form or 4 years when whole. 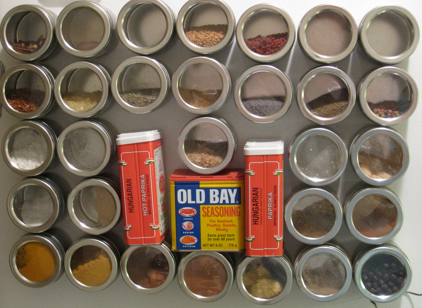 It is important however, to try to keep a dedicated container to each spice. You don ‘t want to mix spices’ aromas. I put the nutmeg in the container I used to have the clove and the nutmeg became clove. If you have to reuse a container for different spice then you have to wash it with warm soapy water and some vinegar to get rid of the previous smells. The last thing we have to talked about is the grinding. 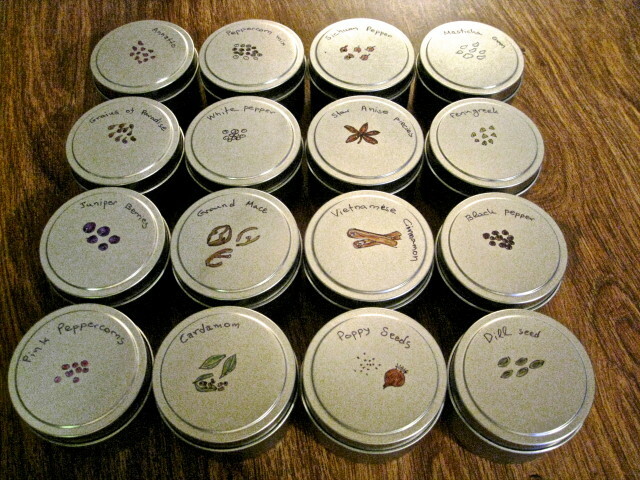 Most of them, can be used whole, but the to release most of the flavors you need to grind them. There are different methods you can do it. Me personal favorite is the mortal and pestle. It is the oldest and most interesting method of doing spice grinding. There are different materials used to make it such, metal, marble, wood and stone. Marble is too smooth, and you cannot grab on the spices. You need some friction to be more effective. Metal is good for holding on the spices but is way to heavy. Although wood is light and was a fine rough surface it adsorbs all the aromas like sponge. Sure it will have a nice aroma for a while but once it starts the rancidification process you will regret it. So my favorite is stone. You can get it for cheap at Asian stores. It is avery good choice especially if you plan to add herbs to the mix. 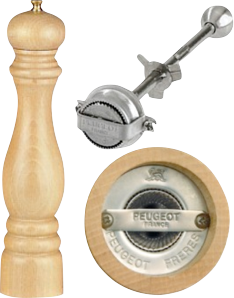 Alternative to that is the burr mill/grinder which consists essentially from a ring and rotating cone both with the groves that actually grab hold on the spices guiding them to a more and more narrow spacing and eventually break them. There are electric, wood, metal, big small, but all it matters is the mechanism that was to be made on a good quality steel that will not rust. The basic idea of this is very simple. There is a cone shaped pice with side groves, on an angle, that is fitted in a funnel type of disk. The spacing between the two pieces is bigger at the top part (where the cone diameter is smaller) and smaller on the other end. The spices are getting caught in the gap and while the cone is rotating (although some cheaper models the disk is rotating and the cone is fixed) are tangled in the grooves and breaking down to the point that they can fit to go through the lower opening. This spacing can the spacing is adjustable either by a screw on the top part of the mill, or even better by a different dial that is located on the actual milling stones. This gives a much better control over the spice grinding. 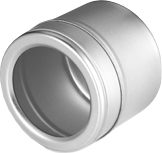 Although steel is the material of the majority of these mills, recently there have been some ceramic models in the market. They are strong, don ‘t rust and remain sharp almost for ever. The only problem with ceramic cutlery is that they break quite easy, which however is a minor concern here, since the mill provides a perfect housing. There are also electric models available, but I am not a fun, if I want to grind large quantities I just use an electric spice (coffee) grinder. None of the methods we suggested is good for If you need to grind big spices such is cinnamon or star anise, ginger or large quantities of small spices as well. I n that case you have to use a coffee grinder. One that is dedicate to spices and preferably has a metal basket, just for the reasons we described above. I am using a plastic one. It is expensive to get one with metal basket. A good wipe with a dump cloth every other use will keep it clean and ready to go. The plastic adsorbs the oils not only due to the porosity but also due to the chemical structure of the polymer that is so close to the chemical structure of the aromatic oils. So, regardless the care some flavor carry over is not that bad after all. I occasionally use the same grinder for coffee too. IT gives it a spice Andes twist to it. Be aware thought that the hard spices will make in mater of time the nice clear lin into a fuzzy scratched translucent lid. 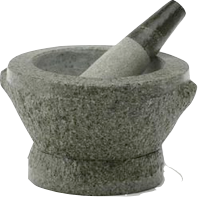 There are also other spice grinders, but for the average, or even the above average home cook, they are not that important. Spices are an excellent method to add flavor and aroma to plain dishes. What would carry be with no spices? Nothing! So explore them get them learn them!! !